WINSTON-SALEM, N.C. – Is there a Quaker aesthetic? It is tantalizing to think so. How the Quakers “resolved the paradoxes of living in the material world,” as Bernard L. Herman wrote in Quaker Aesthetics, a collection of essays published in 2002, is an implicit theme of “Friendly Furniture: Identifying the Quaker Cabinetmakers of Early America.” Organized by the Museum of Early Southern Decorative Arts (MESDA), the two-day program planned for March 24 and 25 in Winston-Salem seeks to document the ways in which styles associated with Quaker craftsmen spread in the eastern United States and to establish, where possible, identifying markers of Quaker design and craftsmanship. “Conceptually speaking, we are working our way down the East Coast, from Rhode Island to Pennsylvania, Virginia and North Carolina. The theme gives us the opportunity to address a much more national topic than is typically the case for MESDA. Migration is a big part of the story,” explains Robert Leath, vice president of collections and research at Old Salem Museums & Gardens, MESDA’s parent institution. The biennial MESDA Furniture Forum is intended for collectors, curators, craftspeople and conservators. After small group sessions for which attendance is limited, the general program kicks off Friday evening, March 24, with dinner and a keynote address by Museum of Fine Arts, Boston, curator Dennis Carr, a contributor to Art and Industry: Rhode Island Furniture, 1650-1830, published by Yale University Press in 2016. How Quaker influence spread is a complicated story. “We found evidence of a number of craftsmen who trained in Newport but ended up working in the South – in North Carolina, Kentucky and Virginia – at the end of their careers,” notes Carr. Newport influence in coastal North Carolina was documented by John Bivins Jr in The Furniture of Coastal North Carolina, 1700-1820 (1988), but relatively little has been written about Quaker craftsmanship in the central part of the state. New work by June Lucas, Old Salem Museum and Garden’s director of research, and by Leath, its chief curator, inspired the symposium. Quakers in large numbers settled in five North Carolina counties, collectively known as the Quaker Crescent, in the second half of the Eighteenth Century. Lucas is focusing on furniture production in the area of Cane Creek, which snakes along the borders of Alamance and Chatham Counties. Leath will look at Quaker-made furniture from Guilford County. Though separated by only 30 miles, these communities responded to different influences, resulting in furniture that is markedly dissimilar. Queries from Wendy Cooper, at the time researching sulfur-inlaid furniture for Paint, Pattern & People: Furniture of Southeastern Pennsylvania, 1725-1850, triggered Lucas’s interest in the subject. 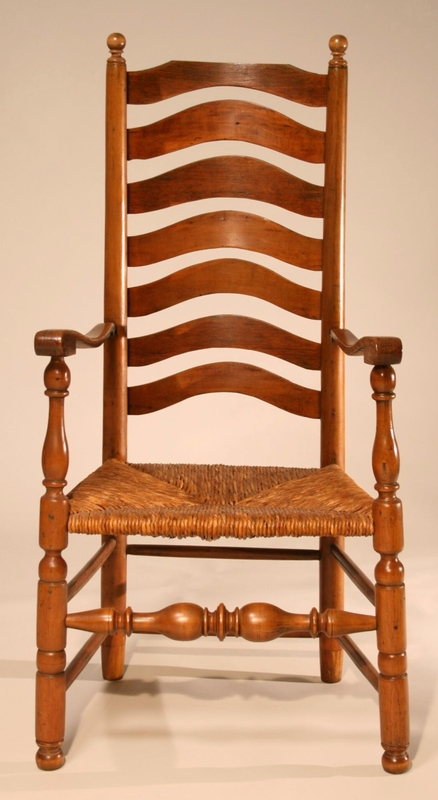 “I took the kernel and ran with it,” say the researcher, whose findings are presented in “The Early Furniture of North Carolina’s Cane Creek Settlement,” to be published in American Furniture 2016, forthcoming from Chipstone Foundation and University Press of New England in mid-April. Much of Lucas’s inquiry focuses on the workshop of Joseph Wells (1729-1804), a member of Cane Creek Meeting, the North Carolina Piedmont’s oldest Quaker community, settled in 1750-51. Wells moved from Chester County, Penn., to Frederick County, Md., before arriving in the area in 1751. 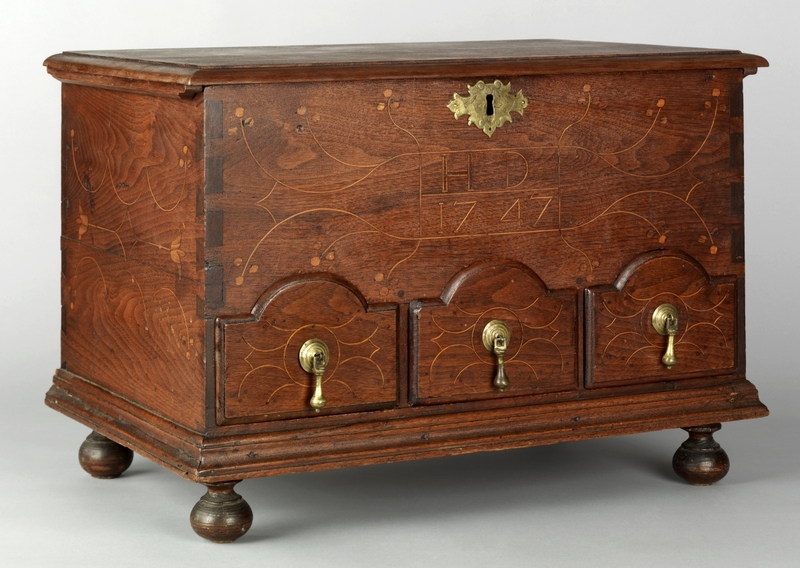 “The concept of Joseph Wells as a cabinetmaker is brand new,” says Lucas, who illustrates her tale with a dated and initialed sulfur-inlaid high chest Wells made for his Germanic neighbors George and Barbara Foust (also Faust) in 1796. “What you have is a Chester County, Penn., Quaker form – a high chest with arched drawers – with decoration that is Germanic,” she says. One remaining puzzle is why no Quaker-made furniture from the first decades of the Cane Creek settlement has surfaced. 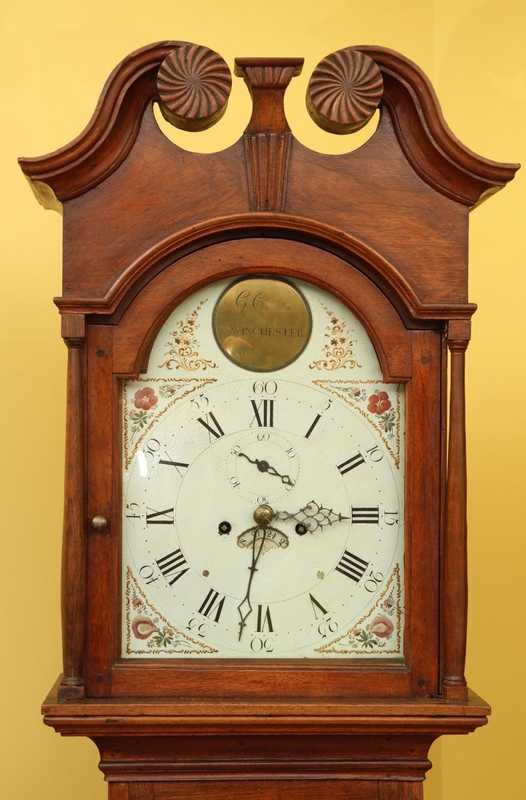 Though Lucas has identified several possibilities, the earliest documented piece, a sulfur-inlaid tall case clock, dates to 1790 and is attributed to the Wells shop. Leath’s research, to be published in MESDA’s Journal of Early Southern Decorative Arts later this year, focuses on Quaker cabinetmakers in Guilford County, N.C., between 1775 and 1825. Leath is particularly interested in Thomas Pierce, Henry Macy (1773-1846) and David Osborne (1759-1833). Pierce arrived in Guilford from Bradford Meeting in Chester County, Penn., in 1775. Born in Nantucket, Mass., Macy settled in the area in 1785, working in the shop of Pierce, who married Macy’s cousin. 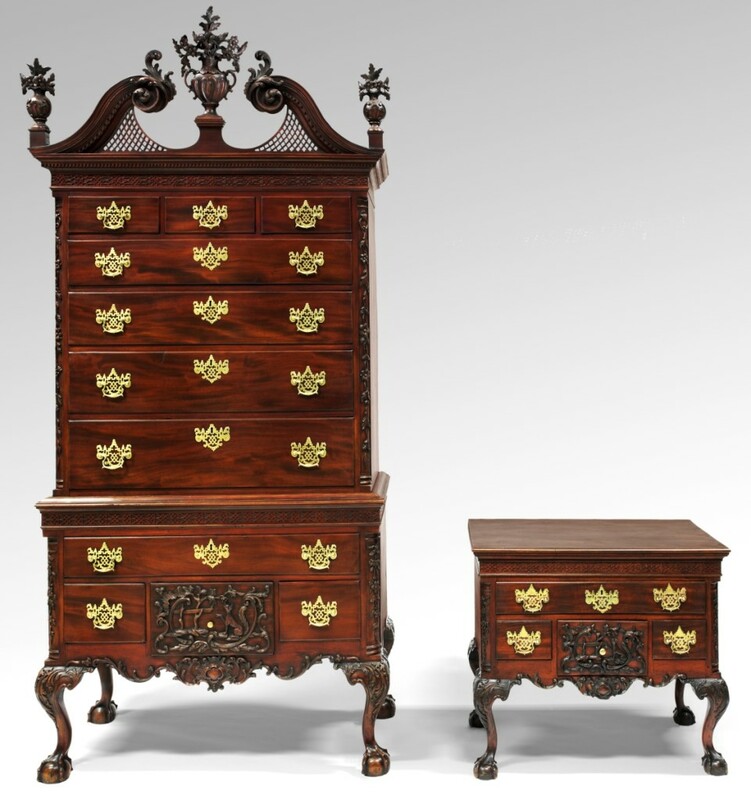 “The Fox and the Grapes” high chest of drawers and dressing table, Philadelphia, 1765–75. Underpinning Leath’s scholarship is Henry Macy’s 1798 account book, now at the Greensboro Historical Museum. It lists clients in southern Guilford and northern Randolph Counties and describes various furniture forms. Leath has reattributed to Macy an important walnut pitched-pediment high chest-on-frame and cellaret in MESDA’s collection. Until recently, both were thought to be the work of Jesse Needham. A desk and bookcase in MESDA’s collection is by David Osborne, who also apprenticed with Pierce. The Quaker aesthetic in Pennsylvania is a question for Alexandra Kirtley and Lisa Minardi. Kirtley, the Montgomery Garvan curator of American decorative arts at the Philadelphia Museum of Art, will examine Philadelphia Quakers as makers and patrons. One point of departure begins with a look at the portrait of Revolutionary War general and Pennsylvania governor Thomas Mifflin and his wife, Sarah, affluent Quakers who sat for Boston painter John Singleton Copley in 1773. “What identifies the Mifflins as Quakers and what identifies them as wealthy? Quakers did not remove themselves from Philadelphia society. Artisans and patrons assimilated to varying degrees,” says Kirtley, noting the complex and sometimes conflicting allegiances of many early Americans. In that vein, the curator will discuss the Philadelphia Quaker cabinetmaker Thomas Affleck, exiled to Winchester, Va., in 1777 when he refused to take up arms against the British. The centerpiece of her presentation is the magnificent “Fox and Grapes” high chest of drawers, a gift to the museum in 1957, and matching dressing table, recently acquired from the heirs of Joe Kindig Jr. Ornately carved in imported mahogany between 1765 and 1775, these pieces representing the apex of Philadelphia Rococo style invoke, paradoxically, a Quakerlike fable warning against vanity and greed. The pair has all the hallmarks of being made for Quaker patrons, says Kirtley. “The Quaker aesthetic, if there is one, is quite varied in southeastern Pennsylvania. You could take the broad perspective that there is a lot of inlaid walnut furniture, but there are distinct local nuances in how that inlay actually looks,” says Lisa Minardi. Building on research she published as co-author of Paint, Pattern & People, Minardi will present new information and recently discovered or reattributed pieces made by craftsmen and shops active between roughly 1720 and 1760. Minardi’s first case study is the so-called Bartram Group. Paint, Pattern & People attributes a 1724 dressing table and a 1725 gate leg table with distinctive line and berry inlays to James Bartram of Marple Township in what was then Chester County. Minardi has found a spice box and chest of drawers to add to this group. A second group is named after the Welsh Quaker immigrant Thomas Thomas. 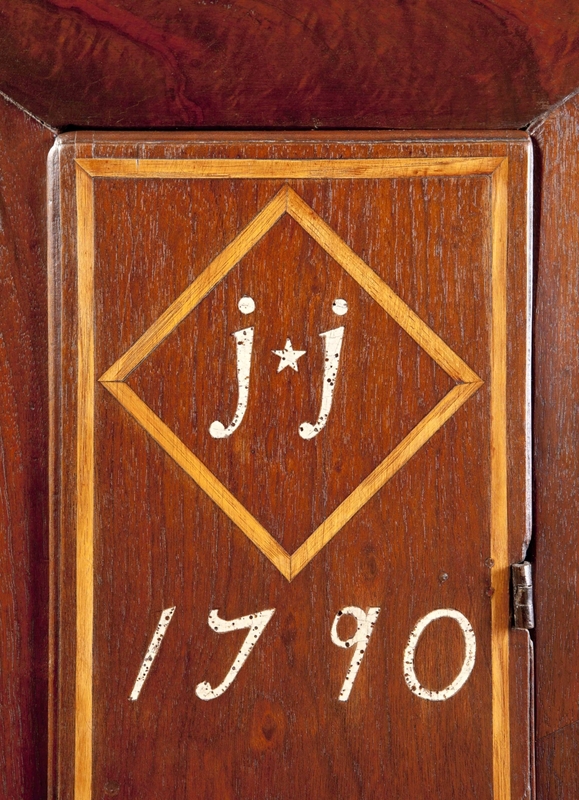 “There are several different styles of inlays, all geometric, associated with this group,” says the scholar, citing the case of a circa 1731 tall clock, auctioned by Sotheby’s in 2016 as part of the Schorsch collection, a 1737 chest of drawers by the same hand and several document boxes. The Chester County craftsman Joel Baily Sr (1697-1772) is at the center of Minardi’s third group. 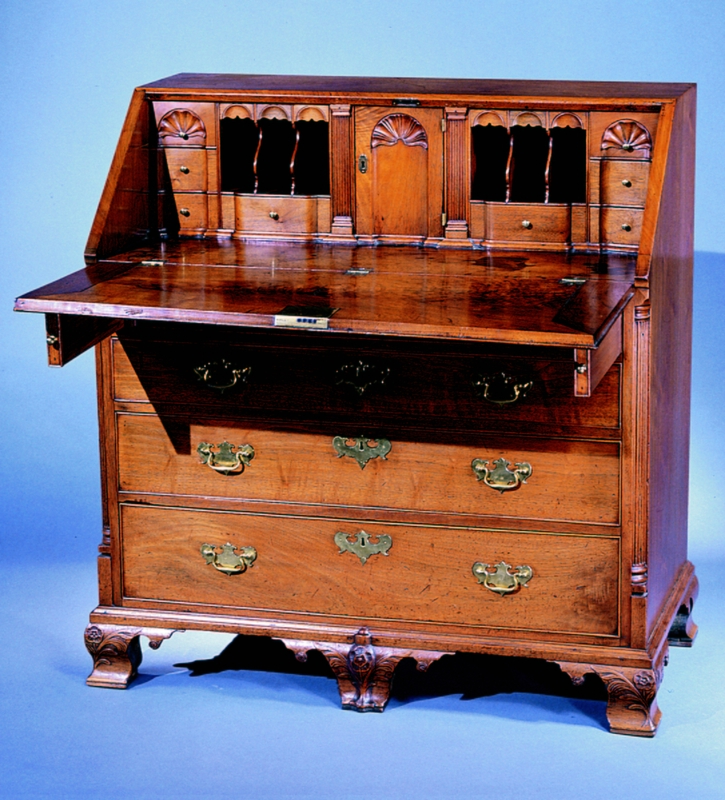 Baily is thought to have made a walnut desk and bookcase, ex-collection of Titus Geesey, inlaid with the date 1744 and the initials “I.M.,” most likely for John Marshall. “This piece is a long-needed bridge between a signed Baily desk at the Chester County Historical Society and a group of inlaid spice boxes long speculated to have been made by Baily,” says Minardi. Baily trained a craftsman who subsequently relocated to North Carolina, where the Chester County influence is pronounced. 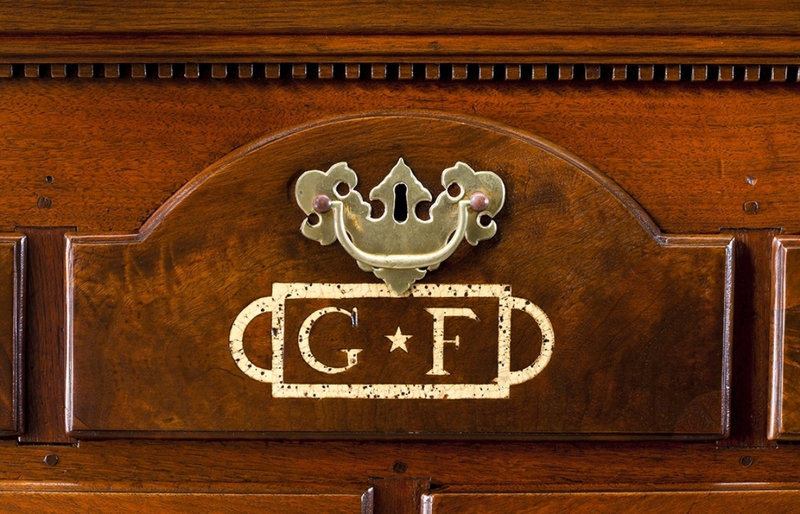 Cooper and Minardi reattributed a fourth group of furniture, notable for its line and berry inlay, from Abraham Darlington to Moses Pyle (d 1784) of London Grove Township in Chester County. Several Pyle-attributed pieces made in the 1740s have arched drawer fronts of the sort Lucas found in Cane Creek, N.C., furniture. Minardi’s last group consists of inlaid furniture made between 1740 and 1760 in the Nottingham area of Chester County. 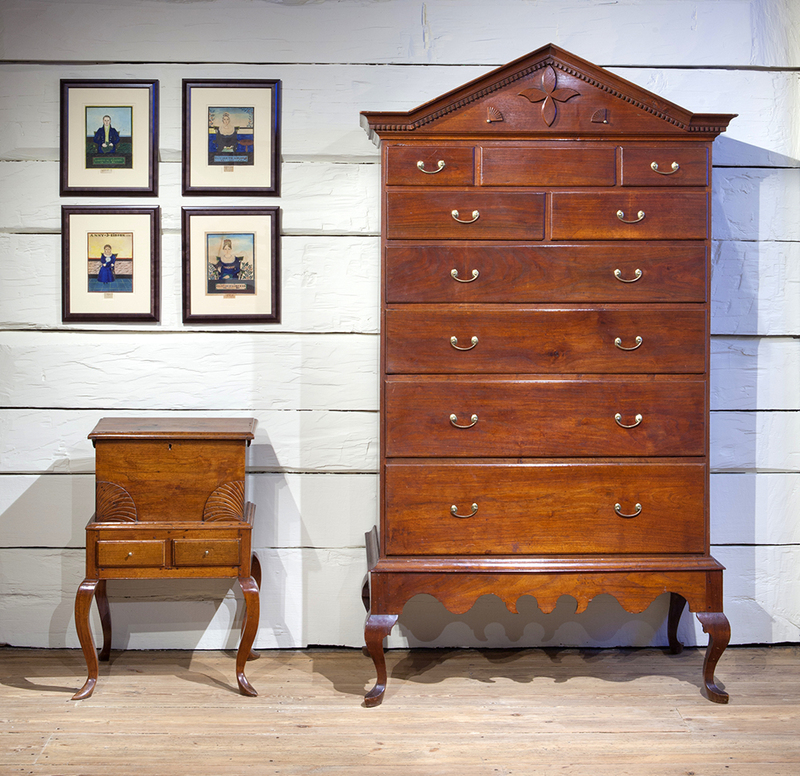 Nick Powers, curator of collections at the Museum of the Shenandoah Valley, brings a personal perspective to his discussion of the Quaker-made furniture of Virginia’s Frederick County, in and around his hometown of Winchester, a hub of cabinetmaking after the Revolution. Powers grew up in Cherry Row, an Eighteenth Century house built by the Quaker David Lupton (1757-1822). A desk and bookcase, card table and one of two known high chests of drawers from Cherry Row are now at Colonial Williamsburg. 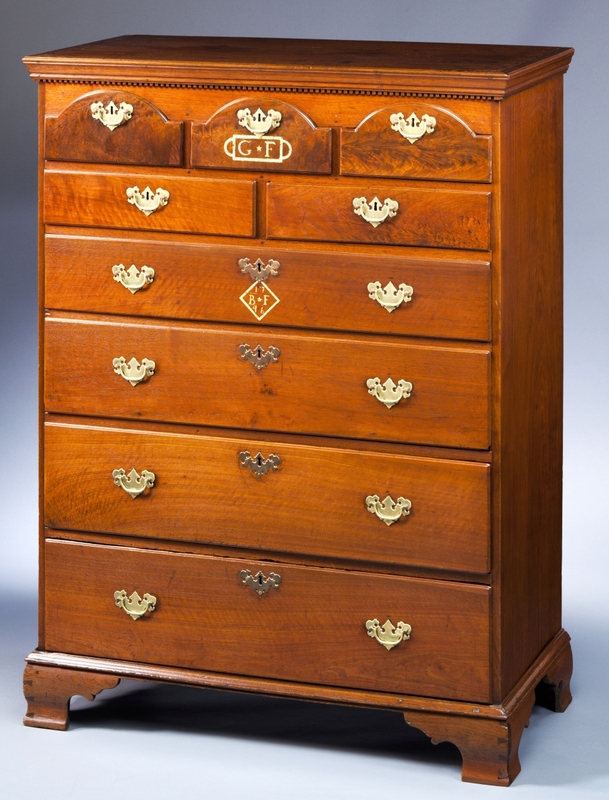 On loan to MESDA, the high chest will be on view during the symposium. Teasing apart the story of Quaker craftsmanship in the Shenandoah Valley is a challenge. “According to family history, Abraham Hollingsworth might have been the earliest Quaker to visit the Shenandoah Valley, but the Chester County, Penn., Quakers who led the migration to Virginia were Alexander Ross and Morgan Bryan. They were followed by Friends from Maryland, Delaware, New York and even New England. My grandfather’s family were Quakers who migrated here from Virginia’s Tidewater region,” says Powers. 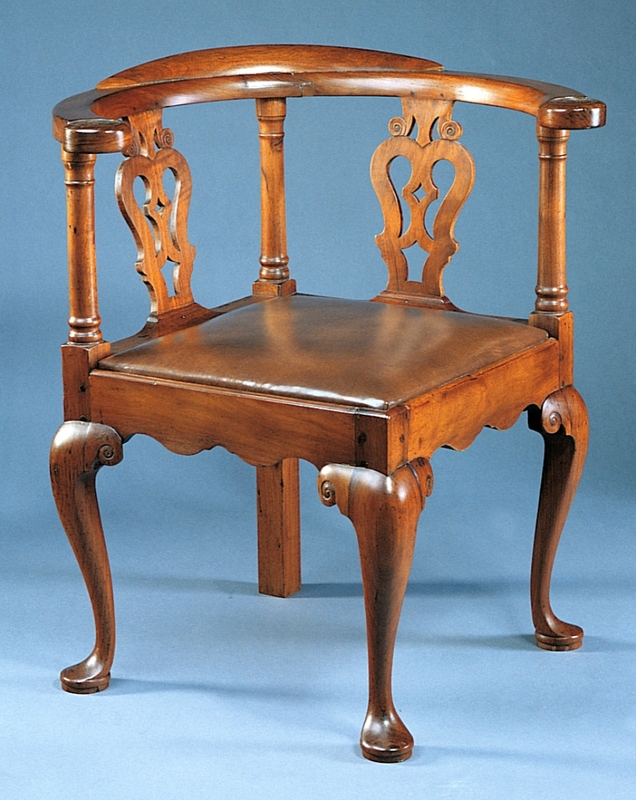 Powers will discuss pieces in private and institutional collections, among them a signed and dated 1787 clock with works by Goldsmith Chandlee (1751-1821) and case by Jonathan Ross (1748-1832) belonging to the Museum of the Shenandoah Valley; a great chair that descended in the family of town founder James Wood that is possibly by Thomas Fawcett (d 1747) or his son Richard Fawcett (d 1789); and a gate leg table from the Hollingsworth family seat Abram’s Delight that descended in either the Hollingsworth or Parkins families. Attendance is limited to 75 for the full program, which includes Friday afternoon carving demonstrations by Mary May of Charleston, S.C., and Ben Hobbs of Hertford, N.C., plus small-group tours of the museum’s Quaker furniture collection by MESDA staff. May will demonstrate carving in the Newport, R.I., style. Inspired by a MESDA-owned slantfront desk by Quaker Thomas White of Perquimans County, N.C., Hobbs will lead a session on coastal Carolina Quaker carving. 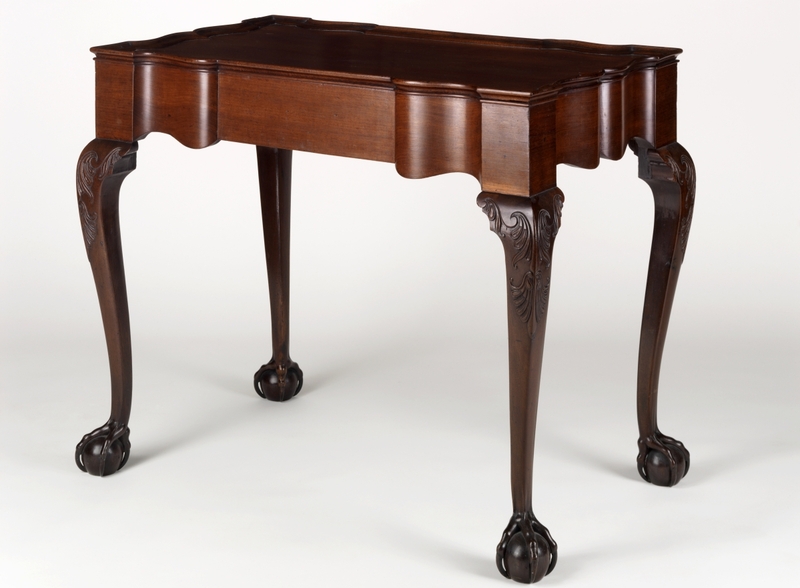 White sold the desk to Hobbs’ ancestor, Thomas Newby, in 1765. MESDA is charging a reduced price for those wishing to attend only Friday’s keynote address and dinner, and Saturday’s lectures. 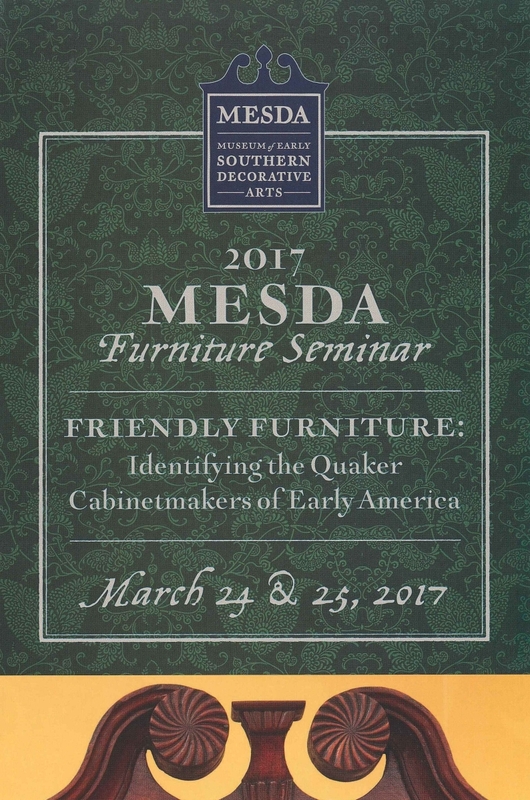 To register online for “Friendly Furniture: Identifying The Quaker Cabinetmakers of Early America,” visit www.mesda.org. For more information, email mesdaprograms@oldsalem.org or call 336-721-7369.